With its rugged, "Full Metal Jacket" all-metal construction and rigid, one-piece aluminum frame, the Daiwa Saltist Saltwater Conventional Reel is a must-have for any serious saltwater fisherman. The Saltist has four ball bearings and a roller bearing; powerful, high-strength alloy gears; dual anti-reverse systems; dual-position power handle; and aluminum rod clamp for superior performance. Special CRBB anti-corrosion spool bearings are shielded to keep grit and abrasives out and last up to twelve times longer in a saltwater environment. The Saltist also has stainless grease-impregnated fiber washers for super-smooth drag with up to 22% greater drag max than similar reels. Saltist gears are machined from Daiwa’s exclusive high-strength alloy stock for a perfect match of strength and smooth feel. With a powerful ratio and rigid support, they deliver up to 30% more winding power than similar reels. 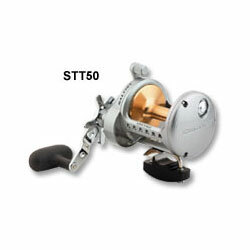 "for the price this is the best reel i have ever used. this is including some that go for over $500. very smooth drag just landed a 34lb but in sf bay on 18lb line without a problem. it is quick to retrieve which takes a little getting use to but that should be handy when dragging up lings and rocks in a few months. i true must have"
"I had purchased two diffrent reels off here. This one and a Penn Senator, both to use for all my fishing. From bottom fishing, trolling to tune fishing this reel held up alot better then the Senator. With the all metal body i thought it would be heavy but infact it was very light."